When the Baltimore Ravens selected Lamar Jackson in the draft last spring, Ozzie Newsome was surprised by the response he received from former players and current players. They all wanted to reach out to Jackson. Newsome recalls being at a function with Cam Newton, the quarterback for the Carolina Panthers. With millennials in general, and pro athletes in particular, portrayed as totally about self, this sort of reaching out is heartening, especially from a veteran black quarterback to a rookie. Newton, who also began mentoring Houston’s Deshaun Watson in high school, said Jackson reminded him of himself: talented, with a unique set of skills for an NFL quarterback. He also knew that a young black quarterback with Jackson’s athletic ability would face plenty of obstacles in a league that still sees athletic talent and championship quarterbacking as not compatible, qualities that at the very least are looked at with skepticism. Newton — 6 feet, 5 inches, and 245 pounds — was the first overall pick in the 2011 NFL draft and is currently the longest-tenured black quarterback in the league. When he became a pro, he said, he felt there was no one he could reach out to in the league. Michael Vick was re-establishing himself after spending nearly two years in prison on dogfighting charges. Donovan McNabb’s star was fading in Washington. Vince Young, to whom Newton was compared, was headed out of the NFL, and JaMarcus Russell was a colossal bust and out of the league. “My road to the NFL was not the stereotypical way,” Newton said. “I was considered a ‘reach,’ kind of similar to any minority quarterback. … I didn’t really have anybody who I could say, ‘Hey, what am I supposed be looking for?’ When I came in, there was nobody who really had the same things that I was bringing to the table. A large reason for reaching out to young quarterbacks like Watson and Jackson is providing reassurance, support and a counternarrative to the one so-called “athletic” quarterbacks so often hear: They cannot throw accurately or make the necessary reads in a complicated passing offense. An emerging body of work says different. “You see it time and time again,” Newton said. “Whether it’s Russell Wilson or RG III [Robert Griffin III] when he was with the Redskins, or myself or Jameis Winston, Deshaun Watson, a lot of guys really are holding their own and bringing their own type of style to the game, and you got to respect it. Newton watched Jackson struggle in his playoff debut Jan. 6 against the Los Angeles Chargers. Critics will say Jackson’s performance was a referendum on the flaws of so-called mobile quarterbacks. Newton, in offering support, said Jackson simply had a bad day. “That happens to everybody. Pocket passers, scrambling quarterbacks,” Newton said. “What Lamar went through is a symptom of playing football in general. I respect the Ravens for not pulling him, because it’s a learning process. He’s a rookie. Hell, I didn’t have my best games sometimes this year, and I’m going into my eighth year. Baltimore Ravens quarterback Lamar Jackson warms up before a game against the Los Angeles Chargers on Dec. 22, 2018. This is the function of a latter-day fraternity of black quarterbacks: providing a perspective and even a safety net. Newton said he plans to speak with Jackson face-to-face during the offseason. His message will be simple: Be who you are; never lose faith. Reaching out across age and generation is still important, whether it’s Newton reaching out to Watson and Jackson or pioneers such as James “Shack” Harris and Warren Moon reaching out to Newton and Dak Prescott. Harris became the first black quarterback to start a regular-season game when he started for the Buffalo Bills in 1969 at age 22. Five years later, on Dec. 22, 1974, he became the first black quarterback to start an NFL playoff game when he led the Los Angeles Rams to a 19-10 victory over Washington at the Los Angeles Memorial Coliseum. More than four decades later, black quarterbacks and quarterbacks of color come in all shapes, sizes and styles of play. 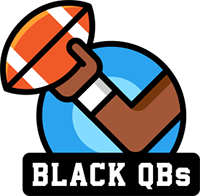 But in many ways, “Black Quarterback” has become a brand that describes a robust style of play, a state of mind and a historic timeline lighting the way for new generations. After he retired, Harris became a front-office executive with Jacksonville, Baltimore and Detroit. Former NFL quarterbacks (L-R) Warren Moon, James Harris, Marlin Briscoe and Doug Williams pose during the Field Generals Press Conference at the Super Bowl Media Center on February 1, 2007 in Miami Beach, Florida. In 2000, Harris, Moon, Doug Williams and Marlin Briscoe formed the Field Generals, a group designed as a fraternity of black quarterbacks. Newton actually attended a Field Generals camp at Walt Disney World when he was in high school. Newton said his exposure to Harris, Moon and Williams is what inspired him to reach out to Jackson and other young quarterbacks of color to provide support, encouragement and a role model. Is there still a need for a fraternity of black quarterbacks? Perhaps now more than ever. “I think it’s a good thing to have,” said Moon, the first African-American quarterback to be inducted into the Pro Football Hall of Fame. Moon said younger black quarterbacks still face challenges. January 28 2016: Team Irvin quarterbacks (L-R) Jameis Winston, Russell Wilson and Teddy Bridgewater pose for a photo after the Pro Bowl practice at Turtle Bay Resort on North Shore Oahu, HI. Harris said he found that younger players initially shy away from a support group for African-American quarterbacks because the conditions over the past four decades have changed. Talented players will get on the field now — although there are studies that show black quarterbacks will be benched faster than their white counterparts after a bad game. The Dallas Cowboys’ Prescott formed a relationship with Harris when he entered the league in 2016. Harris was raised in Monroe, Louisiana, and Prescott was raised about an hour away in Houghton, Louisiana. “I’ve hung out with Shack, played dominoes with him and talked to him,” Prescott said. He also connected with McNabb, the former Philadelphia Eagles quarterback whom he grew up admiring. They exchanged numbers. “[McNabb] actually said he’s working on getting an organization or getting something together that was quarterbacks of color that represented that group,” Prescott said. Prescott refers to himself as a quarterback of color. His mother is white, his father African-American. In an ideal world, though, Prescott would love to simply be seen as a quarterback who completes passes, who wins or loses because he’s either good or bad, not because of his skin color. Before Prescott was drafted, Wade Wilson, who was the Cowboys’ quarterback coach at the time, opened Prescott’s eyes to a reality he had not considered. They bumped into each other at a train station after the 2016 NFL combine. Prescott had no idea at the time that he’d be drafted by Dallas, but Wilson’s question caught him off guard. Prescott gave Wilson his standard response that he was biracial and tried not to see color and that he would hate to think he was being scrutinized because of that. “I told him I wouldn’t let it bother me because I don’t see myself as one color, another color or this or that,” Prescott said. But Wilson said he asked the question because he saw firsthand how Quincy Carter, whom the Cowboys drafted in 2001, struggled. Carter, a talented quarterback out of Georgia, won the starting job, then lost it, then won it back and even led the Cowboys to the playoffs in 2003. The following year, Carter was abruptly cut before the regular season began. It was later revealed that Carter had failed a third drug test. Prescott thinks the world of Wilson and in retrospect realizes that Wilson was likely giving Prescott a wake-up call. As laudable as it was for Prescott not to see color, “He was letting me know that as much as I don’t see it, it’s still there,” Prescott said. Prescott had a sensational rookie season, leading Dallas to the playoffs before losing at home to Green Bay on a miracle play by Aaron Rodgers. Last season was rough; the Cowboys missed the playoffs, and there was grumbling about Prescott. But this season, the Cowboys and Prescott have mostly been outstanding. Prescott was brilliant Jan. 5 as Dallas defeated Seattle before a raucous crowd in Arlington, Texas. On Saturday, Prescott and the Cowboys face a stiff test on the road in Los Angeles. Meanwhile, Kansas City and Patrick Mahomes host the hot Indianapolis Colts. Could there be an unprecedented meeting of two quarterbacks of color in the Super Bowl? Whether there is or not, change is coming. The older models of quarterbacking — Tom Brady, Philip Rivers, Drew Brees, Ben Roethlisberger — are being replaced by newer, diverse ones. This emerging new group of quarterbacks is defined as much by style as by appearance. Black. African-American. Of color. Their presence is no longer a problem to be pondered.